It’s safe to say that eating is a fairly important ritual in most everyone’s day-to-day life. While the kitchen is an essential part of this ritual, your house would not be complete without a designated space to enjoy the fruits (and veggies) of your labor. Here are some ideas for creating the perfect dining space or spaces to complement your lifestyle. 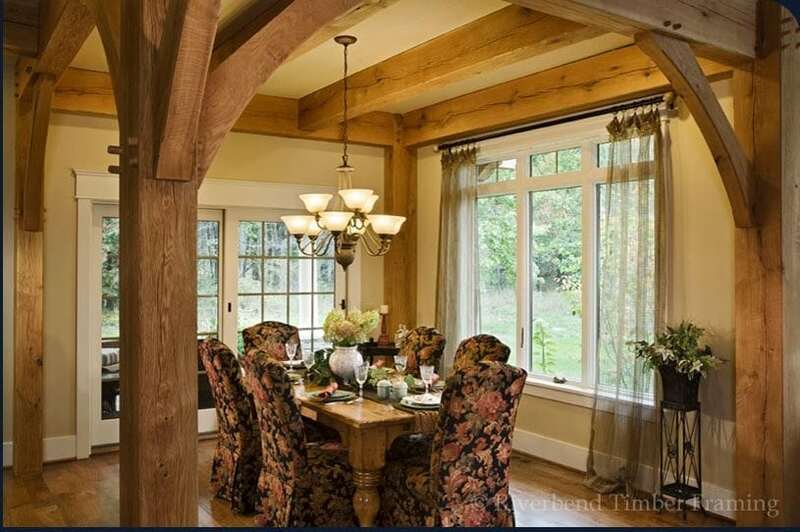 Choosing the location for your dining space is important, especially when considering the traditional open layouts of timber frame homes. 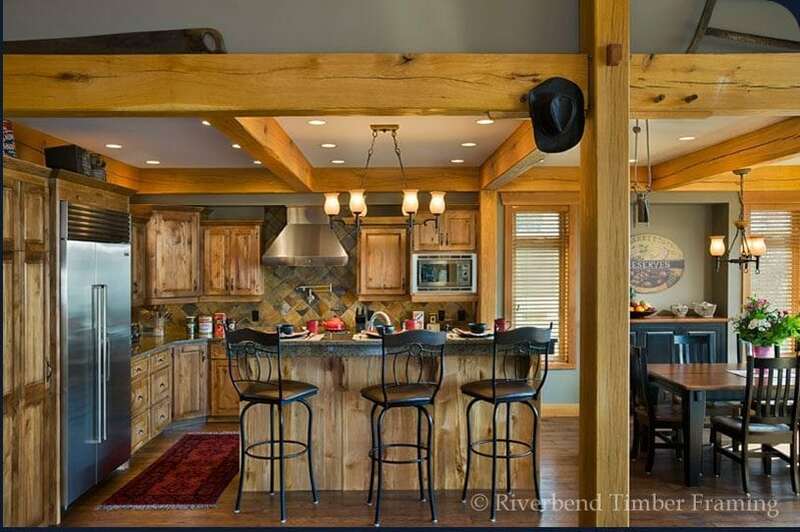 Often times, timber home designs will combine the great room, kitchen, and dining area into one. So, unless you are thinking about an enclosed, private space, you will want to put your dining area in a convenient and accessible spot near your kitchen. This will allow ease for meal setup and cleanup. You could also consider adding a bump out or bay window to your dining area to allow for foot traffic and a more table room, as well as additional light and views. Do you want a separate space where formal occasions would be better suited? Perhaps including both a traditional dining room and a less formal nook area is the appropriate choice for your home. If you don’t foresee yourself using that formal area more than a few times a year, consider combining the purpose and look of informal and formal dining in a neutral space that can be dressed up or down. What does your lifestyle look like? If weekends at your home are filled with visits from your grandchildren or overnight play dates with your kid’s friends, having an informal space like a nook or breakfast bar is perfect for quick and easy meals or a fun family breakfast—buffet style. Are you often the host of game nights with friends? Incorporating a larger island and additional seating in the kitchen area is a great idea for presenting appetizers and finger foods for guests. Perhaps your home’s phenomenal views and outdoor fire pit are a hit for informal get-togethers. Consider including an outdoor dining space in your design so that your family can not only enjoy those views, but also participate in a great outdoor dining experience that goes beyond roasting hot dogs over the fire. Take a look at Riverbend’s photo gallery for more great dining space options, and then discuss with your designer what you would like to incorporate in your future home!